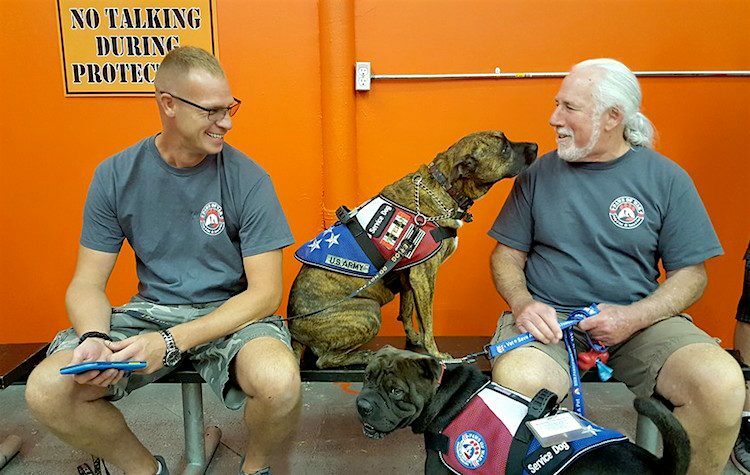 At Paws of War, the mission is to train shelter dogs to become service animals — and loving companions — for veterans in need. After serving 2 years in the U.S. Army in Kosovo, Russell Keyzer came home a changed man. Like hundreds of thousands of soldiers, he struggled to adjust, but as time went on, he got worse instead of better. At first, waves of depression and survivor’s guilt overwhelmed him. Therapy helped, but when the symptoms became physical, his life started to fall apart. He has violent physical reactions to noise and crowds. “There were times that my body felt as if it were physically aggressive, even though psychologically I was not aggressive,” he says. Post-traumatic stress disorder (PTSD) had hijacked his life. Keyzer was in bad shape when he went to the Veterans Administration (VA) in Northport, New York. That day, he met another veteran — a man who had been suffering from PTSD too but was now doing much better. The difference? Paws of War. 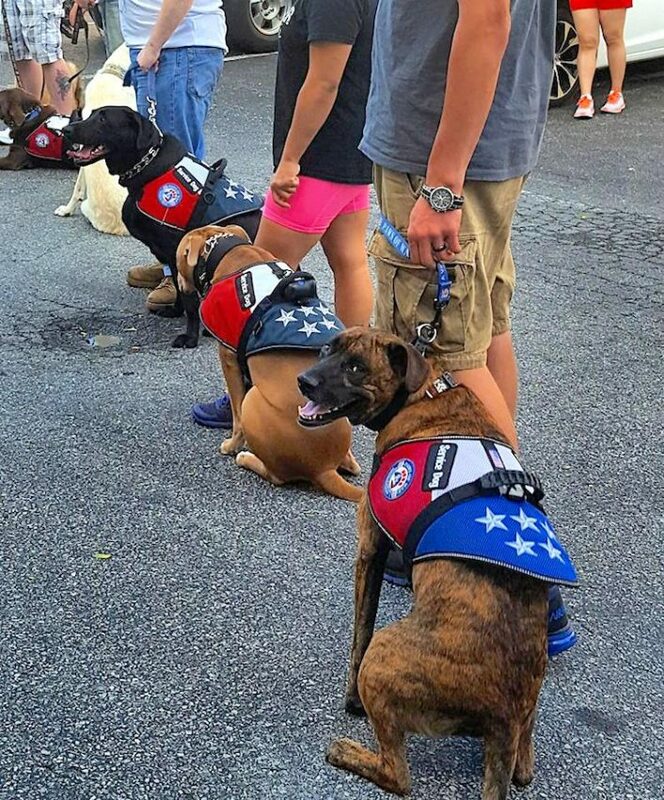 “We started talking, and he told me how much his service dog helped him. I thought maybe a dog would help me too,” Keyzer says. What he didn’t realize in that moment was that his life was about to change. Dogs have to meet certain criteria if they are to become service animals at Paws of War. 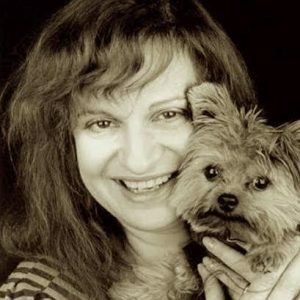 The dogs they take in come exclusively from shelters and rescues, says co-founder Robert Misseri. They do, occasionally, work with a dog a veteran already has if the dog can be trained for service. Health: While dogs may have to learn how to do different services depending on the situation, the dogs must first be healthy enough to work. Drive: One of the most important factors in choosing dogs is their drive, which is their desire to work or to do something. Three primary drives motivate service dogs: food, prey (toys) and affection (belonging to a pack). Dogs who will do anything for food, for example, or a ball as reward will make excellent service dogs. Sociability: The dogs should be comfortable around other animals, people and children while retaining the capability to focus on their person. They have a job to do. Dogs can’t do that job if they can’t resist running off after that squirrel, and they might actually put their people in danger. So, focus, comfort and affability are the best combination of qualities. 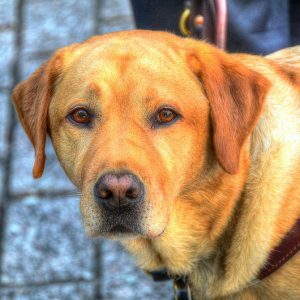 Intelligence: A service dog must be able to learn new skills and retain what is learned. Intelligence in this case is measured by how fast a dog can learn and how efficient they are at remembering what they learned. Trainability: This is similar to intelligence, but to be trainable, the dog must also have drive. If the dog wants to learn, is excited to learn and has the drive to get their reward, then that dog is very trainable. If a dog lacks either intelligence or drive, the process is much more difficult. 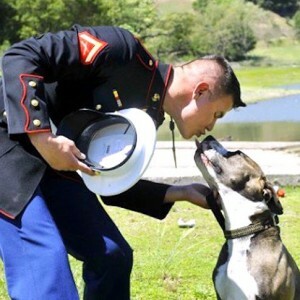 Origin and gender: These are relevant only when the veteran has preferences and/or has an existing dog in the household who will need to get along with the service dog. 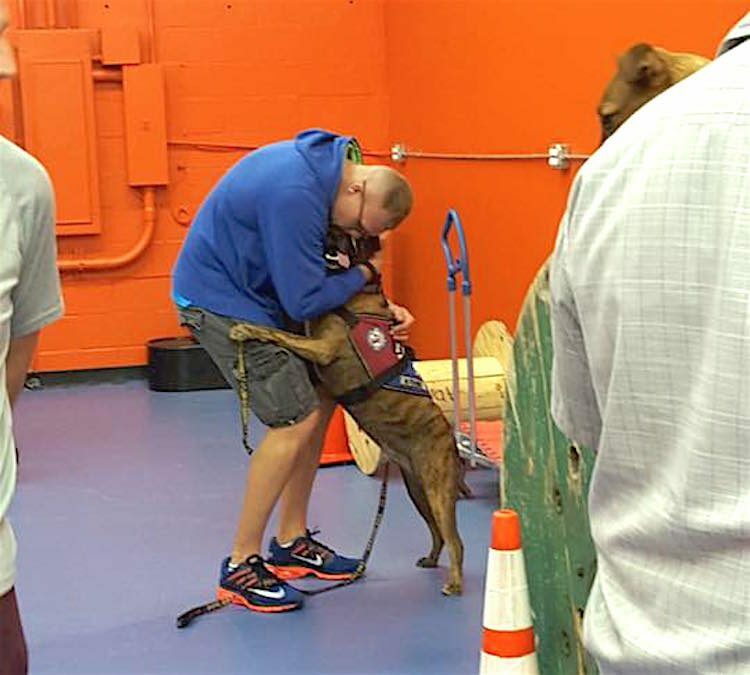 At Paws of War, veterans and dogs learn to understand each other. 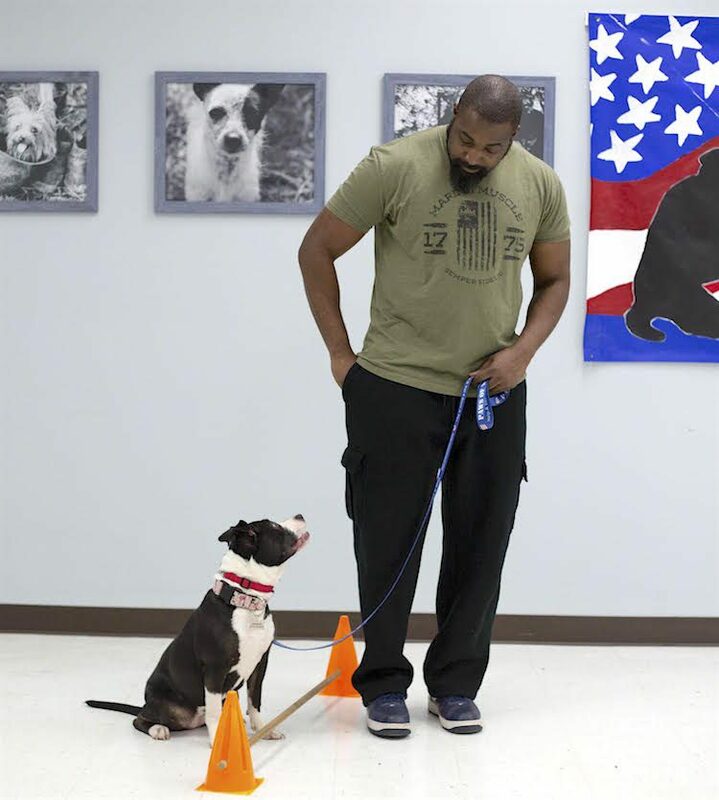 “Our training process takes the veteran/dog pair through a variety of steps,” says Misseri. It takes longer for some dogs to become service dogs than others, depending on how quickly each dog catches on. For some dogs, this process takes 6 months. For others, it can take up to 18 months. Training starts with beginner classes that cover the essential obedience skills that all dogs need to know, including sit, stay, down, etc. The next step is the intermediate training, which covers more advanced obedience skills and translates them into real-life situations. What this means will depend on the veteran’s needs, and these skills will be adjusted throughout their life together as needs change and evolve. The final step is advanced training, when the dogs and their partners perfect their real-life skills and focus on individual, task-specific training. Once the dog goes home, regular training brush-up sessions are important. “We very closely monitor progress for all veteran/dog pairs in our program,” says Misseri. The veterans are very involved in the training process, Misseri notes. 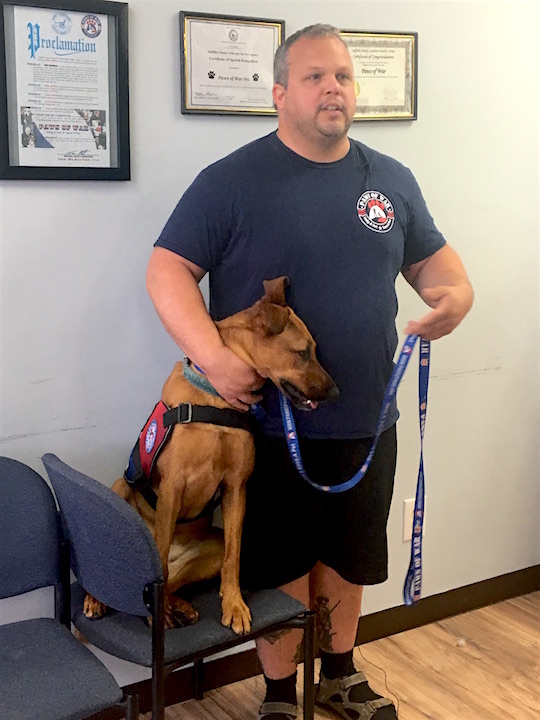 The veteran and their dog attend training classes and work through the program together. The dog learns the necessary skills, and the veteran learns to communicate their needs to the dog. Continued training is important because needs can change. Here’s Russell Keyzer and his service dog, Artemis. She was trained by Paws of War. Russell Keyzer arrived at Paws of War at the same time the organization had taken in 3 litters of puppies. The group was in the process of figuring out which puppies would train as service dogs and which would go up for adoption or into foster. “One of the founders of Paws of War had a puppy in mind for me,” Keyzer recalls. Of the many things Artemis does for Keyzer, her companionship has helped him the most. Keyzer lives alone, and he finds living with her gives him comfort. She also forces him to go out of the house and be more social with other people. And then there are her specialized skills. He reached a point where the crowd was triggering him, and he couldn’t go to the meetings. “I was sitting outside in the hallway, trying to listen in. The dog allowed me to be engaged in those groups,” he says. Lights, noise and crowds are all triggers for Keyzer’s PTSD. Artemis will put her body between Keyzer and other people to create physical space. “She’ll know before I do that someone in close proximity will trigger my symptoms,” he says. She will sense his anxiety growing and give him a signal when it’s time to leave. Keyzer is a recovery coach, and he gives regular presentations to different groups. “If I’m speaking somewhere, and I start getting too passionate about what I’m talking about, the anxiety goes up, the blood pressure goes up, and she’ll start mouthing my hand, which is her signal for me to breathe, to calm down,” he says. Thanks to Paws of War, both dogs and veterans can provide comfort to each other. Keyzer has physical reactions to his symptoms. For example, he will leap to his feet as a physical response to anxiety. But his dog senses this is about to happen, and she climbs into his lap to anchor him. “I’m just sitting there petting her, but she’s in my lap to keep me in one position. Yet it looks so natural to other people,” he says. Shortly after Keyzer began working with Artemis, his knee gave out. He had to use a cane. “Even though the dog originally wasn’t supposed to be for stability, we just adjusted,” he says. They changed the vest she wears and trained her to walk a little farther out from Keyzer’s side to pull him onto his good knee and give him stability. 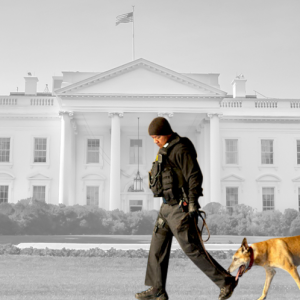 Having a service dog has done more for Russell Keyzer than he ever imagined. “My PTSD is under control. I can go to the gym again, I can go to the grocery store. I think those are the biggest changes. That’s the real quality of life,” he says.